This position is assumed from the carry by slipping the right hand upward about 4 inches and then thrusting the arm forward shoulder high and horizontal to the marching surface forming an approximate 45-degree angle. 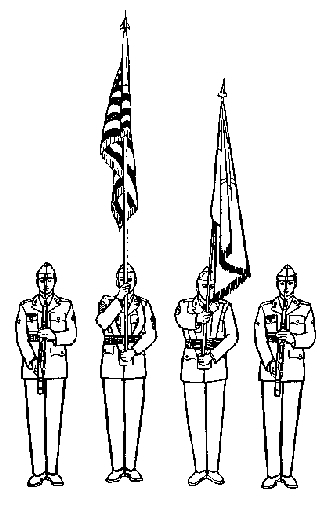 When the Colors salute with troops who execute present arms from the order, the Color bearers assume the position of carry at the command ARMS and then execute the Color salute. When casing or uncasing Colors indoors (at the order), the organizational Color bearer salutes (dips) by slipping his right hand upward and grasping the staff firmly, with the forearm horizontal and the staff thrust forward until the arm is fully extended.